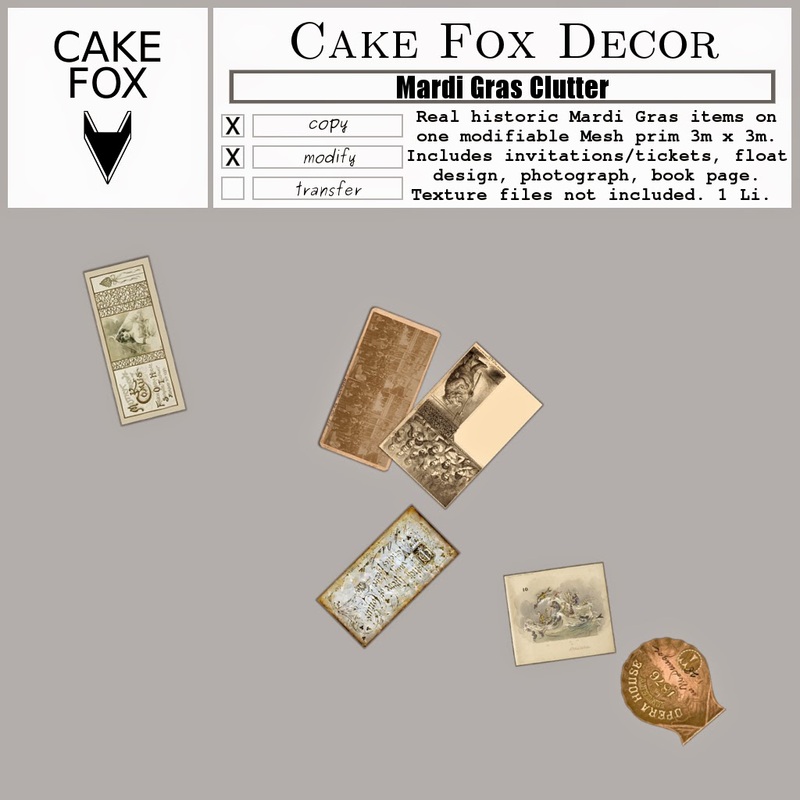 Cake Fox is participating in two Mardi Gras events. Mieville Mardi Gras will take place between 14th and 17th of February, 2015 at the French Quarter of Victorian Steampunk New Orleans, in Mieville Poe. 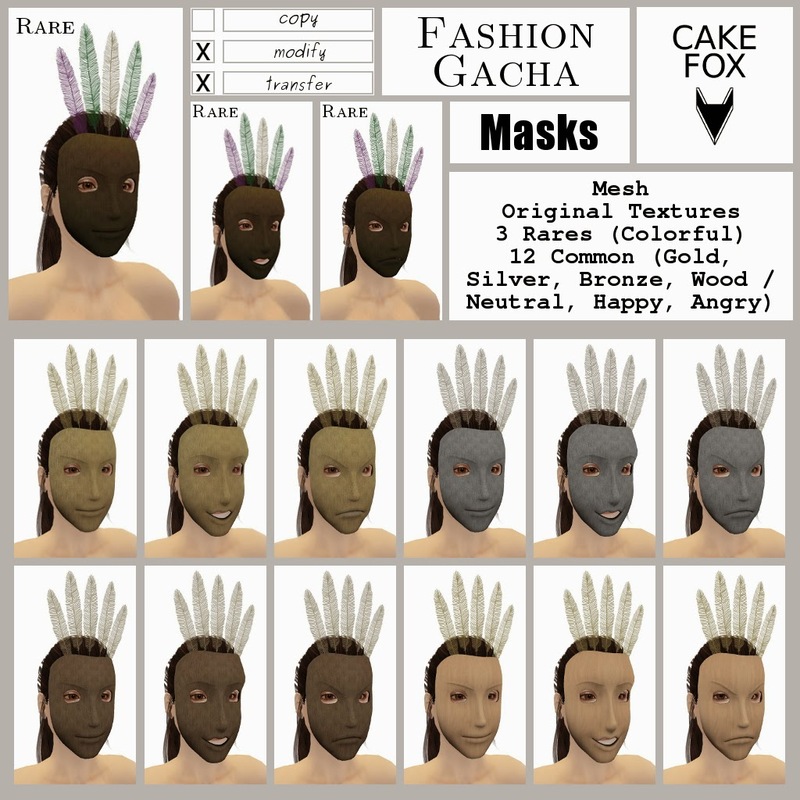 As well as a long pier filled with Mardi gras themed sales wagons full of items from a wide range of Second Life stores, there is also a gacha area. The Mardi Gras celebration dance, with a costume and titler contest, will take place on 17th February, evening SL time. Go to Raglan Shire Mexican Mardi Gras Square for the Tiny Mardi Gras happenings. Artisans of the Raglan sim cluster will have their wares available there in little shops around the square, and in the middle is an event spot, where you will be able to dance to music by some great dj's and live performers. For the schedule, keep an eye on The Raglan Shire Events Calendar. You should definitely check out the annual Grand Mardi Gras Parade of Floats, 22nd February, 2015 at 12 Noon SL time. This was the first tiny event I ever participated in and since then I have gone every year. It is full of funny floats, chaos and laughter, just as one would expect from a popular tiny event. People build their own floats, and you are welcome to pick up the float kit at Raglan Silly Cube from now until right before the go time (both Dinkie and Tiny versions are available), and join us with your design. The parade usually takes a few laps around the neighborhood close to Silly Cube, and then ends up at the Mardi Gras Square, where there will be music and a chance to take a closer look at the floats. 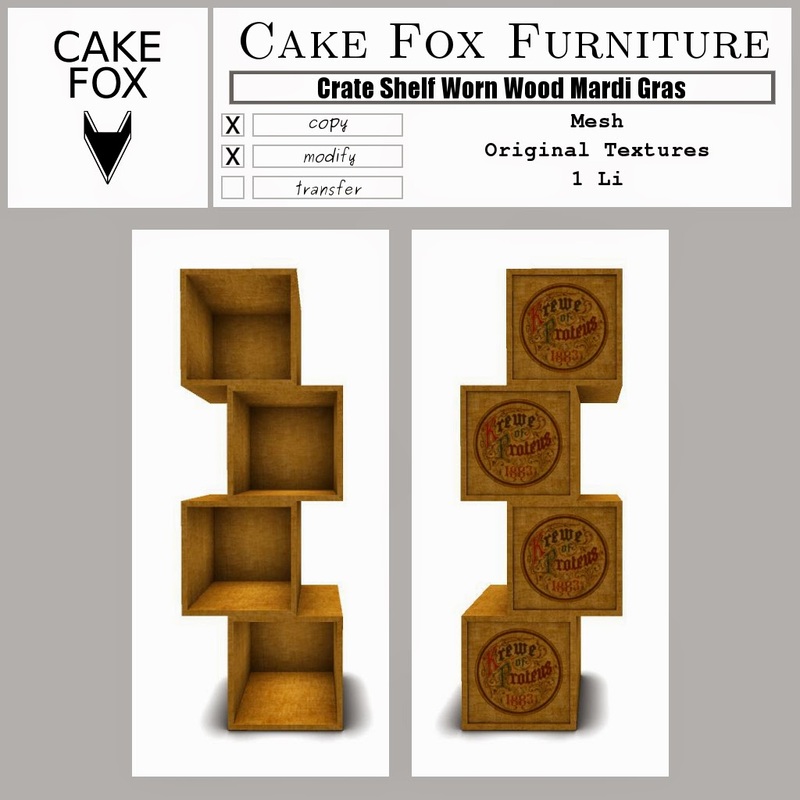 Here are the new Cake Fox items for the Mardi Gras theme. Two gachas with fashion items. Please try the demos, as there are no refunds of gacha items. The Mardi Gras masks include 3 rares and 12 commons. They come in three different moods: "Neutral", "Happy" and "Angry" and five different color schemes: Gold, Silver, Bronze, Wood and Colorful, which were created with original textures. The Mardi Gras Tophats have nine different options, the ninth one being the rare. Original textures were used in creating these items. Silk for the hats, hand drawn feathers, and shiny sequins or watercolored metals for the flowers. You can modify the hats and change the size. Be careful though, because there is just the one copy and no redeliveries on gacha items. 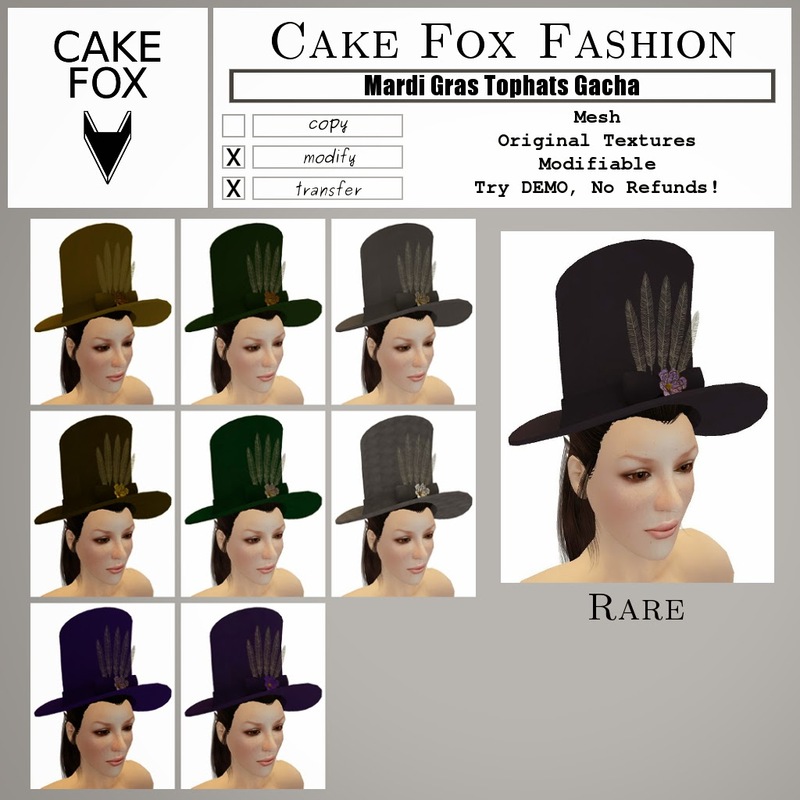 Real historic Mardi gras items are featured in the cheapie item made for this theme. The modifiable 3m x 3m mesh piece has invitations, a photograph, a book page and a float design scattered on it to use as a decoration. You can put it on the floor or size it to fit a table. This item is only 5 Lindens. 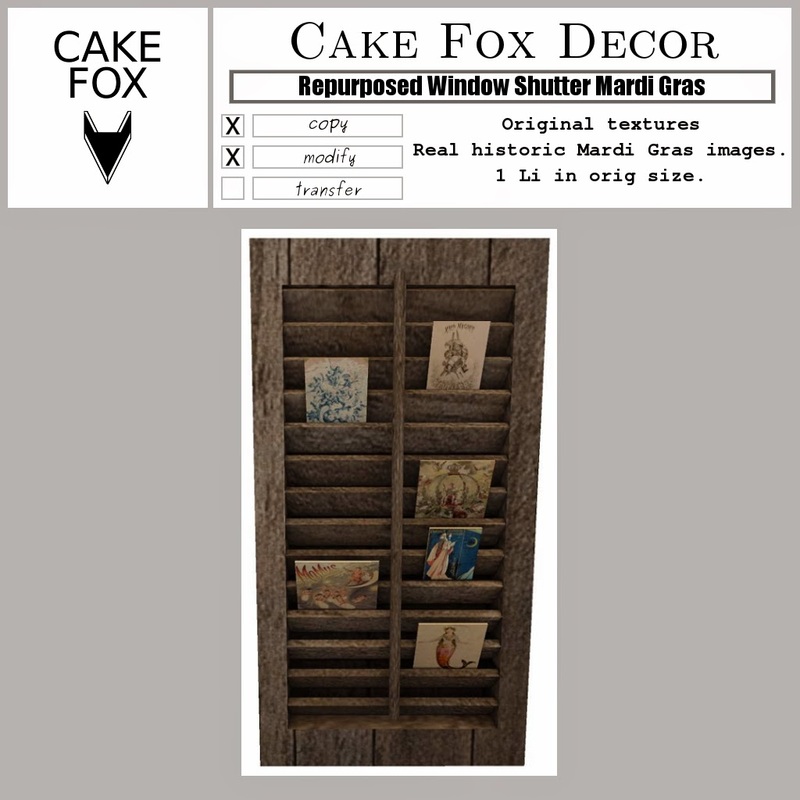 The Repurposed Window shutter has Mardi gras themed images such as float designs and invitations slipped between the slates. The item is 1 LI only, everything included. The Crate Shelf has an original worn wood texture and is only 1 Li. The Mardi Gras version is decorated with a logo taken from a real Mardi Gras themed invitation. (All Mardi gras images used were legally obtained, from public domain sources).